Stacey Kamp started painting when she was a child. Raised in Marin County, Stacey had the good fortune of being surrounded by Northern California’s famous natural beauty, a vibrant local arts community, and a grandmother who nurtured her with lessons in oil painting, pottery, photography and more. At the age of 18 Stacey worked for upscale doll house artist Eric Lansdown at his Hunters Point Studio. She was brought in to help with sales and development of the growing business, but was also trained to help with the faux painting and trompe l’oeil during busy seasons. During that time Stacey also picked up a job with the famed Bill Graham working in the Ambiance Department. For eight years Stacey was part of a team that provided the ambiance for artists in venues such as the Warfield and the Oakland Coliseum. In her early 20’s Stacey work for several event production companies. When Stacey turned 21 in 1993 she began bartending at a popular bar on Fishermans Wharf. Doing special events and bartending evenings at several bars for years, Stacey was able to put herself through college and obtain her BA in Psychology and MA in Counseling. Through a college fieldwork class Stacey, began volunteering for a non-profit which turned into a 30 hour a week, seven year, volunteer position as Art Director of the Marin Interfaith Youth Outreach Teen Center in San Rafael. She was able to obtain grants and scholarships based on the work she was doing in the arts that paid for the majority of her education. Although Art production and education was Stacey’s strong suit she continued to paint for pleasure throughout her life. It wasn’t until 2004 that Stacey actually began taking her artwork more seriously. With the purchase of her first home, she saw her lean budget and art supplies as an opportunity to decorate DIY-style. Her pragmatic efforts paid off: the Birch series was born, which she considers her first serious body of work. The bigger reward though, was rediscovering her passion for creating art. When her father passed away in 2009, Stacey immersed herself in her studio’s sanctuary. The act of painting was deeply therapeutic and meditative. A year later when her grief began to lift, she saw the huge amount of work she created as an expression of her grief, but also of a calm, quiet focus. The same Zen approach she cultivated spills into her life today: while she has always been wide-eyed and amazed about nature, Stacey is especially awestruck by all the little miracles that surround her and feels blessed to witness so many instances of profound beauty in her daily life. With the encouragement of a friend, in 2009, Stacey entered her first art show and sold four out of five of her paintings. Over the last 10 years, painting has become a growing source of personal, creative, emotional, and spiritual expression in Stacey’s life. 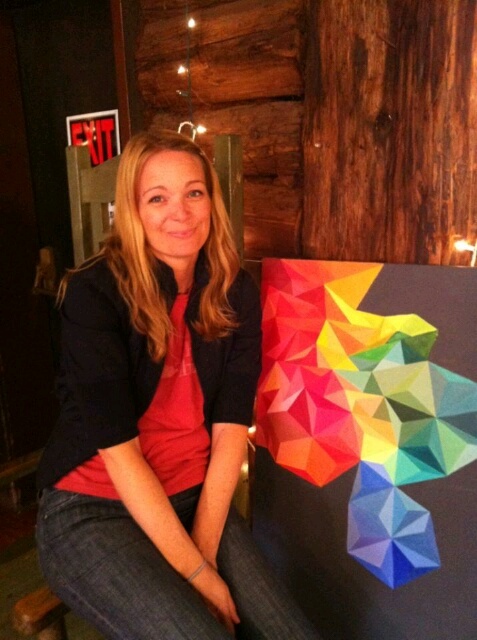 Stacey is founder of Local Art Productions, a lively pop-up one night art show with DJ, cocktails and food trucks that draws crowds to see the work of up to 40 artists. She has held a seat on the San Anselmo Arts Commission for five years, been a seven-year member of RAW Natural Born Artists, as well as currently Managing the historic Log Cabin and Events Manager of the Marin Art and Garden Center in Ross where she feels fortunate to coordinate for hundreds of beautiful weddings, memorials and art exhibitions every year. When not painting, Stacey can be found swimming, scooting around town on her Vespa Piaggio or tending bar at the Dugout Bar. Her work is sold nationally and internationally. Stacey lives in San Anselmo, California with her partner and cat Cookie Monsta.